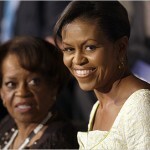 Michelle Obama may be the power behind the throne, but the power behind the power is Michelle’s fabulous mama, Marian. (Mother and daughter are pictured here.) And it’s now official that Marian, who looks after Sasha and Malia when the girls’ parents are away, is moving in to the White House. I mean, really: was there ever any doubt? Of the impending move, which will take her away from her longtime home in Chicago, Marian said: “I might fuss a little, but I’ll be there.” Fuss all you want, Mrs. R.